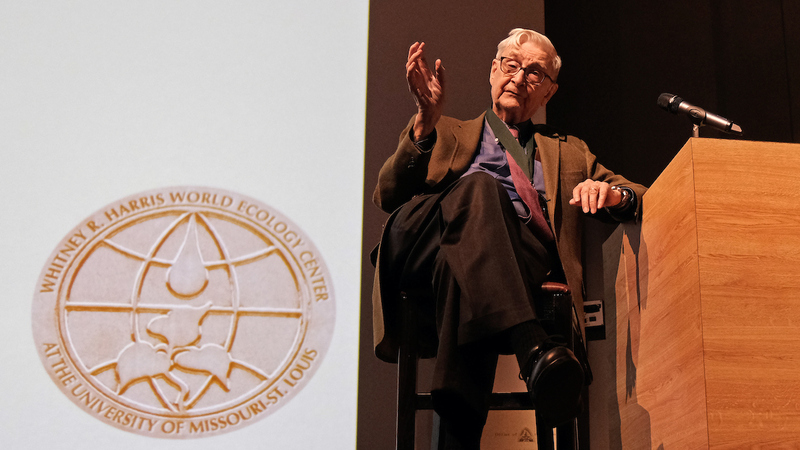 Two-time Pulitzer Prize-winning entomologist Edward O. Wilson answers questions from the audience after receiving the World Ecology Award from the Whitney R. Harris World Ecology Center at the University of Missouri–St. Louis Friday night in the Anheuser-Busch Theatre at the Saint Louis Zoo. Original story posted in the USML Daily. 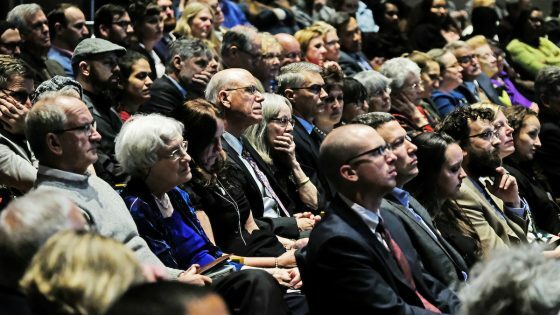 Edward O. Wilson’s work has been lauded the world over with a list of awards – including two Pulitzer Prizes, a National Medal of Science and an International Prize for Biology – too numerous to mention in full. But the noted biologist, researcher, theorist, naturalist and author seemed humbled as ever to add one more honor Friday night. On what Mayor Lyda Krewson by proclamation declared Edward O. Wilson Day in the City of St. Louis, Wilson became the 22nd recipient of the World Ecology Award from the Whitney R. Harris World Ecology Center at the University of Missouri–St. Louis. Interim Director Patricia Parker, the E. Desmond Lee Endowed Professor of Zoological Studies, helped introduce Wilson at the award presentation along with Peter Raven, the president emeritus of the Missouri Botanical Garden. 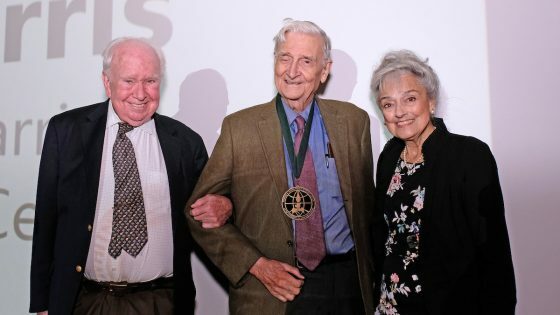 Peter Raven (left) and Anna Harris (right) stand with Edward O. Wilson after presenting him with the World Ecology Award. Raven, a driving force behind the creation of the Harris Center along with his many other career achievements, is one of the 21 other recipients of the World Ecology Award, first bestowed on John Denver in 1990. Others include Jacques Cousteau, Jane Goodall, Harrison Ford and Sylvia Earle. What ties them together is they are all individuals who have raised public awareness of global ecological issues and made significant contributions to environmental protection and biodiversity conservation. Wilson, the Pellegrino University Research Professor, Emeritus in Entomology for the Department of Organismic and Evolutionary Biology at Harvard University, falls right in line with his predecessors. The 88-year-old has been called the “father of biodiversity” and has earned acclaim for his work researching the behavior of ants. He is a two-time winner of the Pulitzer Prize for General Nonfiction for “On Human Nature” in 1979 and “The Ants” in 1991, and has been a pioneer at preserving and protecting the biodiversity of the planet. He made it the central theme of his acceptance speech. 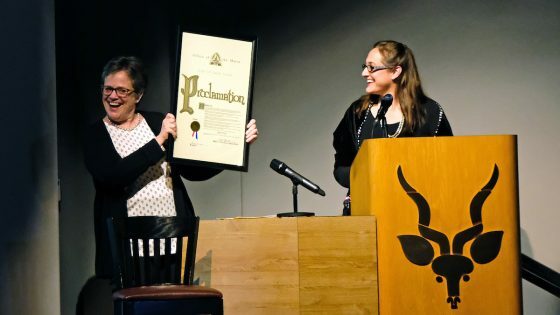 Catherine Werner (at right), the sustainability director for the City of St. Louis, reads a proclamation held by Whitney R. Harris World Ecology Center interim Director Patricia Parker. The proclamation from Mayor Lyda Krewson declared April 20, 2018, “Edward O. Wilson Day in the City of St. Louis”. The awards presentation – and dinner gala that preceded it – came at the end of a packed day in St. Louis for Wilson. He toured UMSL’s Harris Center partners – the Missouri Botanical Garden and Saint Louis Zoo – and had lunch with UMSL graduate students in biology whose training and research in ecology and conservation are supported by the center. A near-capacity crowd in the Anheuser-Busch Theatre listens as Edward O. Wilson delivers his acceptance speech. Proceeds from the gala dinner go to aid those efforts. The Harris Center has helped support more than 275 master’s and Ph.D. graduates since it began as the International Center for Tropical Ecology in 1990. They’ve come from 38 countries and returned to work in more than 30 countries in academic, governmental and nongovernmental positions connected to ecology and biodiversity conservation. If I had to think of someone deserving this great award, probably few people beside Sir Edward Wilson would be on the list. I couldn’t read all his books, but The Ants and The Super organism written together with the great Bert Hölldobler are just pieces of art for naturalists. So glad he got this well deserved price! More and more students of ecology and people worldwide must listen to Wilson Sir to understand the responsibility of global citizens.